Please note: this is the USA model and can only be shipped to US ZIP codes. 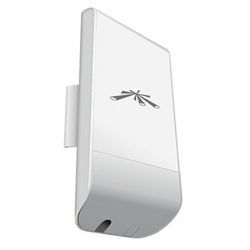 The NanoStation Loco M5 outdoor wireless router includes a built-in 13dBi gain patch antenna that delivers a powerful semi-directional 802.11a/n signal. Designed for pole mounting, it features up to 9 miles of range performance, 150+ Mbps of throughput performance, and the powerful, intuitive AirOS software. The weather-proof enclosure makes installation simple... Thanks to the included PoE injector, the only cord to run to the NanoStation Loco M5 is your Ethernet network cable. Includes PoE injector and zipties. Note: Operation may not be legal in all jurisdictions.